Terrorism is arguably the biggest threat to humanity and every major country is at their wits end on how to eradicate it completely. It’s no surprise that in Bollywood as well in Hollywood, plenty of films have been made that talk about terror attacks and other related aspects. Talking specifically about Bollywood, some very interesting flicks have tackled terrorism like DIL SE , BLACK FRIDAY , NEW YORK , A WEDNESDAY , THE ATTACKS OF 26/11 , FANAA , FIZA , PHANTOM  etc to name a few. 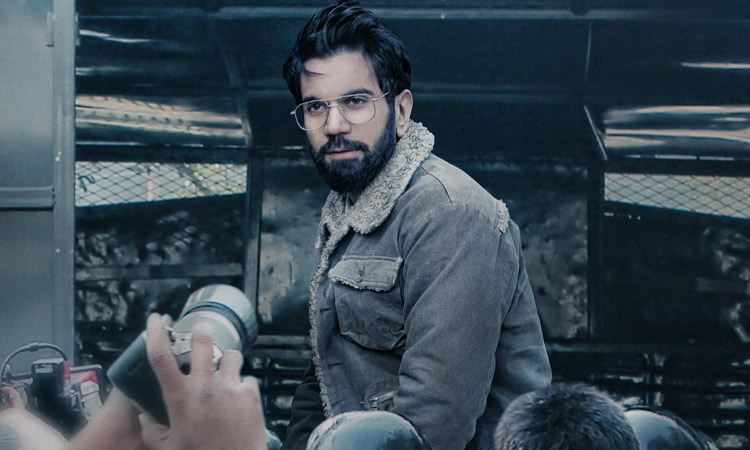 Hansal Mehta now brings up OMERTA and this film promises to stand out from the rest as it talks about one of the most dangerous terrorists of the world. So does OMERTA manage to shock and awe? Or does it fail in its endeavour? Let’s analyze. OMERTA is the story of Omar Saeed Sheikh and how he emerged as one of the forces to reckon with. Omar Saeed Sheikh (Rajkummar Rao) is British-born who gets affected with the way Muslims got butchered in the Bosnian war in 1994. At first, he joins the local protest with like-minded individuals. It’s at this point that he’s offered a chance to go one level up in this field and he agrees. After an intense training session, he arrives in Delhi and assumes the identity of Rohit Verma. He befriends a foreigner named Rhys Patridge and his friends and then kidnaps them to send a message to the world that the Whites are not safe. However, this act of Omar leads to his arrest. He gets released in 1999 along with two other terrorists in exchange for the hostages of the Indian Airlines that was hijacked from Nepal. What happens next and how Omar rises in the world of terrorism is what the film is all about. OMERTA gets into a very unconventional zone right from the word ‘Go’. From the manner in which the introduction and lead character is established to the non-linear narrative, a lot of aspects in this film don’t follow the norms. One of the most memorable sequences of the film has to be the kidnappings of foreigners in Delhi. The way Omar befriends them with his smooth talk in British accent looks absolutely real. One can actually feel that anybody else in the place of the foreigner would have fallen for it. In a way, it also helps viewers delves into the minds of these terrorists and how they are ready to go to any length for their endeavour. The entire Daniel Pearl episode is also engaging, and chilling. On the flipside, the unconventional narrative does make it difficult to digest things. There’s no message as such in the film and one really wishes that Omar’s fall or the fact that Omar regretting to choose this line of work is shown. Moreover, Omar’s contribution in the 26/11 terror attacks is only briefly put forward. The makers should have explored this angle more as it’s quite shocking. Actor Mukul Dev has written the story and it’s definitely interesting and novel. Dialogues are sharp. Hansal Mehta’s screenplay is terrific, especially in Delhi kidnappings and Daniel Pearl episode. But otherwise, it’s decent to even shaky at places. The film suffers a bit as a result of this inconsistency. Same goes for Hansal Mehta’s direction – he has handled the angle of Omar’s relationship with his father well. It makes an important comment how family’s silence can also play a role in their children going the wrong way. He also nicely creates the dark and violent feel for the film so that audiences get sucked in the world of Omar. But at some places, it leaves a lot to be desired. For instance, Hansal does show that Omar has a wife Saadia (Orvana Ghai) but he doesn’t delve much into this aspect. OMERTA belongs to Rajkummar Rao – no doubts on that. In his brief career, he has given some marvelous performances and with this flick, he continues his tradition. Notice how he has worked on his body language, accent, voice, eye movements – it’s drastically different from any other performance of his. OMERTA just confirms that Rajkummar is one of the finest actors that we have today. Timothy Ryan Hickernell (Daniel Pearl) leaves a mark as a passionate reporter whose quest for reporting leads to his gruesome death. Rajesh Tailang (ISI General Mahmood) is okay initially but makes his presence in the sequence where he comes to meet Omar wearing a burkha. Rupinder Nagra (Maulana Ismail) has a natural foreign accent that works to his advantage. Performance wise, he’s fair. Orvana Ghai sadly gets no scope. The actors playing Rhys Partridge and Omar’s father are quite nice. Ishaan Chhabra’s music has the thrill element that keeps the tension going. There’s just one song but is hardly memorable. Anuj Dhawan’s cinematography is quite raw and rugged in the tension-filled, action scenes. But it’s also quite simple and neat as per the requirement of the scene. Aditya Warrior’s editing is slick and razor sharp. Neil Chowdhury’s production design is authentic. Harpal Singh and Ravi Kumar’s action is quite gritty and disturbing. On the whole, OMERTA has some engrossing moments and Rajkummar Rao’s award-worthy performance as its USP. But the unconventional narrative and dark, violent theme of the film will restrict its appeal. Box office wise, this film will have a tough road ahead but critically, it’s bound to get accolades.